The story of this manuscript began with my decision to go back to school to earn my PhD, 24 years after gaining my MSN and 30 years long years after gaining my BSN (my midlife “brain re-energizer” event). In 2011 I reached a career crossroads that led to a transition into graduate school as a full time PhD student at the University of Illinois in Chicago (UIC), College of Nursing. In my position immediately prior to entering the PhD program I was a Chief Nursing Officer (CNO) of a 300 bed community based teaching hospital who grappled daily with decisions around nurse staffing. Like many CNOs I was overseeing clinical areas operating under financial constraints and trying to meet or exceed a productivity metric at the 25% while maintaining high levels of quality, safety, and patient satisfaction. 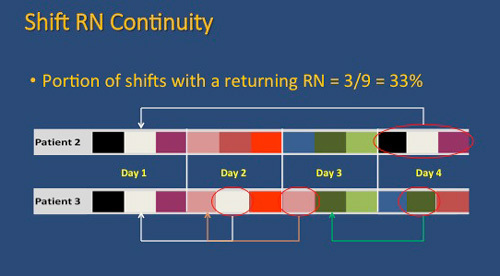 A significant source of frustration was the absence of real time, readily accessible, meaningful data to help me demonstrate to non-nursing executive leadership the possible association between our staffing decisions (floating; downsizing/ consolidating, and closing units; use of temporary and part-time personnel) and possible adverse patient outcomes. At the same time, a second major imperative driving both the budget, manpower issues, and discussions around patient care outcomes was our uptake of a new electronic health record (EHR). I felt strongly that the answer to my data deficit was there in the new EHR, but how to access it? I wanted to work smarter and become more knowledgeable about engaging in this new world of EHR big data science. With the UIC doctoral program I recognized a clear synergy between my clinical issues, research interests, and the work of Dr. Gail Keenan and the HANDS (Hands On Automated Nursing Data System) team. 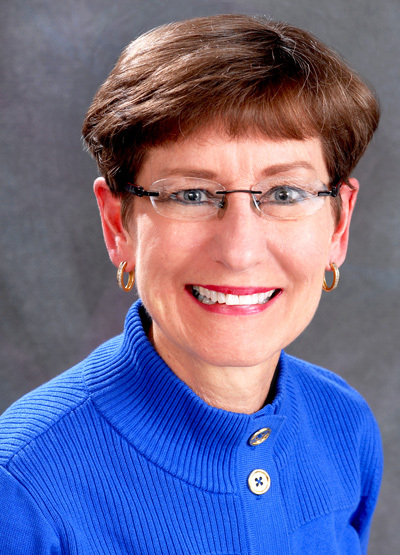 Dr. Keenan’s HANDS database, an electronic nursing plan of care system, actualized my vision of using the EHR, with data being collected as part of routine nursing documentation, to begin examining the influence of nurse staffing on patient outcomes. My specific focus on nurse continuity as a critical nurse staffing variable evolved out of a discussion with members of the HANDS team one day in our simulation lab at the university. Dr. Yingwei Yao, the statistician for the HANDS team, had created schematic diagrams using bands of color to visually depict the poor continuity of caregivers in sample admissions found in the HANDS database. A startling finding in these random examples was how few RN staff actually had the opportunity to care for the same patient within the same admission. What was also startling was that almost everyone around the table participating in the discussion could relate a similar story of having a family member, friend or themselves cared for with little to no continuity of nurse caregivers while hospitalized. Finally, a key driver to my study of nurse continuity was how little was published in the nurse staffing literature on this topic. Despite the fact that it seems to be such a clearly held assumption by RNs that continuity in nurse staffing would lead to better outcomes, there is little data to substantiate this hypothesis, and in many institutions our staffing priorities are leading to anything but nurse continuity at the bedside. 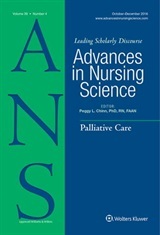 These early discussions and the lack of studies in the literature were the seeds to my PhD dissertation, an examination of the association of nurse staffing variables, including nurse continuity, on the development of hospital-acquired pressure ulcers, using HANDS as the data source to operationalize my study variables. The genesis of this manuscript was the discovery during my literature review that some of the difficulties that arise from studying nurse continuity is due to the diverse definitions of the term and the absence of systematic methods for measuring the influence of continuity. I was also unable to locate a conceptual model that depicted continuity as I felt it operated – both as a direct influence on patient outcomes as well as a moderating influence on other nurse-staffing variables such as experience, education, and nurse-to-patient ratios. Thus, the purpose of this manuscript is to summarize the available research on nurse continuity and to present a framework and an innovative method for research regarding the influence of nurse continuity on patient outcomes. Working with the HANDS team and this program of research has allowed me to blend 34 years of clinical experience with an academic inquiry around the issues of technology, nurse staffing, and patient outcomes. I have been exposed to the worlds of patient centered outcomes research, big data science, and data mining techniques through a research team that includes engineers, computer scientists, and nurses experts. 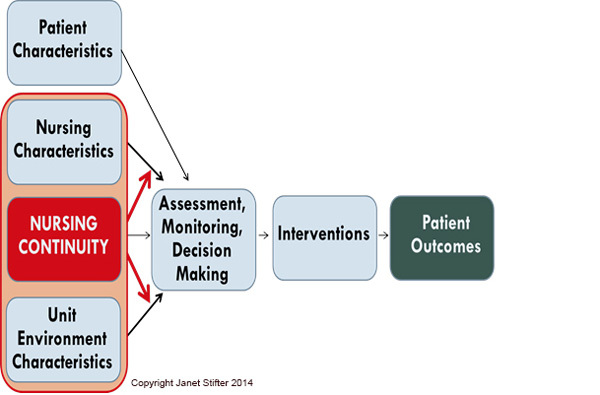 I have also had the opportunity to create a conceptual model that moves nurse continuity into the mainstream of discussion around nursing staffing variables and patient outcomes. The next steps for this research program and the HANDS team includes a comparative analysis of indices used for measuring continuity and a replication study examining the influence of nurse continuity and other nurse-staffing variables on pain outcomes. I join Janet in inviting you to download this important article while it is available at no cost, read it, and return here for some good online conversation!